RAVAS MForks won the 2012 Fork Lift Truck Association (FLTA) Award for Excellence in the Safety Category. In 2010 RAVAS won the British FLTA-Innovation Award for iForks, a wireless fork scale for forklifts. MForks is the first load moment monitoring system integrated into the forks of counterbalanced trucks and reach trucks. 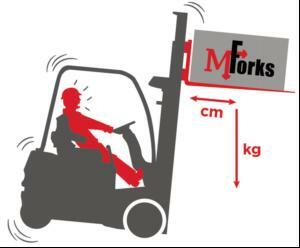 MForks measures both the weight of the load and the position of its load centre. According to the FLTA, safety is the number one priority. MForks is designed to signal overloading of counterbalanced trucks and reach trucks, in order to prevent trucks from tipping over and forks from breaking. Every forklift truck has a load diagram which shows the maximum lifting capacity in relation to the position of the load centre. In practice its left to the forklift driver to interpret the load diagram and to decide whether a load can be lifted safely. Until today no tool existed that indicates the actual load moment on the forks. MForks changes this: from now on every lift truck driver can have a clear indication of whether a load is being lifted safely. A patented measurement system is incorporated into the forks, which measures a combination of the load's weight and its load centre point: the load moment. As a result the MForks indicator, which is mounted in the forklift cabin, calculates whether the load, in its current position on the forks, may be lifted safely. The indicator shows the actual load moment as a percentage of the maximum lifting capacity for the actual load centre. If the load moment exceeds the 100% limit, a warning buzzer sounds. This way, the driver can always accurately judge whether the situation is safe. The FLTA Awards for Excellence 2012 were presented across 10 categories. The winners were chosen either by the FLTA Board and the industry as a whole, for making a superb contribution to materials handling in their category. The FLTA is internationally recognised as a leading independent authority on fork lift trucks. It exists to maintain and raise standards in the materials handling industry. Every year the FLTA nominates the most innovative, ground-breaking products and ideas of importance for the materials handling industry in the categories safety, ergonomics, environment and innovation. Its nominations are a trusted guide to the best new products and innovations. Other nominees in the safety category included Linde, Toyota, and Hyundai.